On 11th October i-Classics Empty Minds premiered at Klokgebouw in Eindhoven, followed by a performance at Complex in Maastricht. 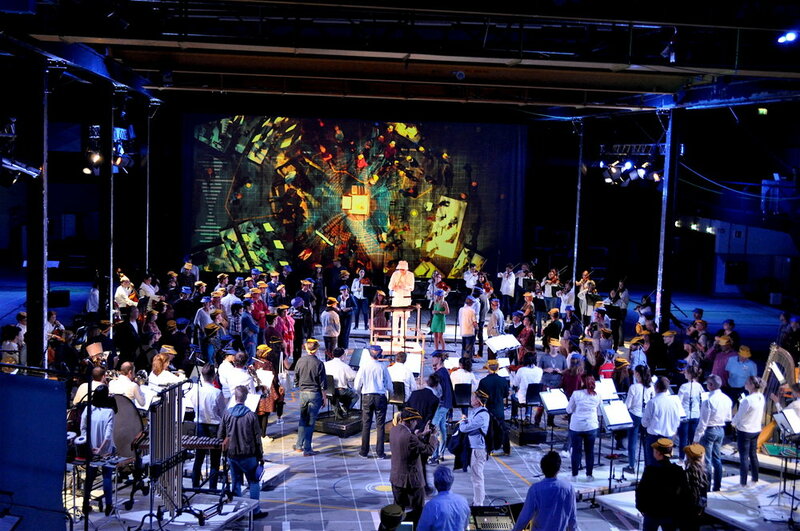 Rather than leaning back the audience become a part of a complete new experience of music, fashion design and video in a performance accompanied by more than 50 musicians. Scroll down for more images! In the past ten years, FASHIONCLASH has developed as an innovative interdisciplinary platform known for the many clashes. Special collaboration projects have been developed in which fashion clashed with theater, dance, film and art. philharmonie zuidnednederland x FASHIONCLASH is maybe not the expected cooperation, but this is exactly what FASHIONCLASH aspires. By placing fashion design in a different context, questioning fashion, discovering fashion in the broadest form of the word, new fashion narratives are born and encounters are born. For this project FASHIONCLASH has invited the playField. collective to develop a concept and direct the play in which public participation is a guiding principle. In addition, jewellery designer and prop maker Minou Lejeune is invited to design a hat that will be part of the audience experience. i-Classics Empty Minds is a production by philharmonie zuidnednederland, in collaboration with playField. and FASHIONCLASH. playField. is a young art collective based in Gent (Belgium) which explores the boundaries between actor and spectator. Through interactive installations they invite the audience to join a shared experience. From the first invitation to participation onwards, the unscripted dialogue between the audience and the actors, as well as the collective experience, are important for the spectators perception. The outcome of a performance therefore lies not only in the hands of its creators, the spectators are equally responsible in this matter.playField. uses philosophical, sociological, data scientific, astronomical and mathematical research as a starting point to reflect on society and la condition humaine. playField. explores these topics by putting the focus on the spectator in a dramaturgy which combines reality and fiction. Minou Lejeune, born in Maastricht, the Netherlands, is graduated as a Jewellery designer at MAFAD: Maastricht Academy of Fine Arts and Design. She sees herself as a jewellery designer and prop maker. In her work, she takes the normal out of its context, twists and play with it, to see where it ends up. She wishes to explore the limits within the relationship between fashion, wearable objects and performance. Her body related objects are made to be part of something bigger. It’s her aim to collaborate with all kinds of ‘story tellers’; art directors, photographers, fashion designers, and so on. Wim Henderickx is a Flemish composer, based in Antwerp. He studied compositon and percussion at the Royal Conservatoire in Antwerp and sonology at Ircam in Paris and at the Conservatoire of Music in The Hague. Many of his works are influenced by oriental music and philosophy. He wrote works for opera, music theatre, orchestra, choirs, windband and chamber music. Electronics are often an important feature in his music. Following a journey around India and Nepal he composed the TANTRIC CYCLE. Commissioned by the Queen Elisabeth Competition, he composed CANZONE for voice and piano, for the semi finals of the 2008 edition. In October 2016 BLOSSOMINGS for choir, trumpet and electronics premiered at LSO St Luke's in London with the BBC Singers, Marco Blaauw (trumpet) and Martyn Brabbins (conductor). REQUIEM was commissioned by Opera Ballet Vlaanderen in 2017, a collaboration with choreographer Sidi Larbi Cherkaoui. Jorrit Tamminga Jorrit Tamminga composes music for various instruments and ensembles, in combination with electronics. He also makes music theater performances, in combination with film and live electronics. As an improvising musician he regularly performs with various musicians in which he plays the live electronics. Jorrit programs live electronics for composers, for music theater performances, orchestras and ensembles.